In the beginning was the Word. Then there were the twelve, chosen as disciples. Among the twelve there were three: Peter, James and John. They seemed to be set apart from the others in their relationship with the Master. The three were central to many teachings, and the only disciples present for the Transfiguration and in the Garden. Peter became the Bishop of Rome, John had a Revelation on Patmos, and James went to Spain. In the ancient world, Spain was literally 'The Ends of the Earth'; Saint James, Santiago in Spanish, appears to have preached there without great success. He returned to Jerusalem to become the first martyr, beheaded by Harod Agrippa in AD 44. Several of his disciples gathered his body and sailed for Galicia, interring him in Iria Flavia, modern day Santiago. Time passes, the Roman Empire falls, Visigoths move south, Moors move north, and Santiago's resting place becomes a distant memory. In the ninth century, a religious hermit named Pelayo is lead to the tomb of the Apostle. It is declared to be authentic by the local bishop, the king of Asturias, and eventually, the Pope. Religious relics in the Middle Ages were thought to possess great power, and bring one closer to God. First a trickle, then a flood of pilgrims headed for Galicia, hoping for a contact with the divine. 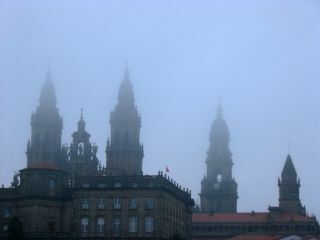 Thus begins the Camino de Santiago, the Way of Saint James. The first routes traversed the rugged northern regions of Spain. The French were invited to establish a more hospitable route, which they did with their usual aplomb. With them they brought Romanesque architecture, along with the artisans, sculptors, shopkeepers and priests for the new settlements along the Way. A complete network of roads and villages sprung up to accommodate the pilgrims' needs. Place names persist, such as Villafranca del Bierzo, which attest to the French presence on the Camino. At it's peak in the 12th century, there were an estimated half million to a million Peregrinos on the Road at any given time. The Camino began outside the pilgrim's door, but did not end in Santiago: the faithful then walked home. Often there would be an absence of several years, and many perished along the Way. Heat, cold, wolves, banditry and sickness all took their toll on the wayfarer. Yet they continued to flow into Santiago, the numbers only declining after the discovery of the New World. Jerusalem, Rome and Santiago were the three most important pilgrimages one could make in the Middle Ages. Jerusalem fell to Islamic forces in 636 AD, and in 711 Spain was conquered as well. The Muslim invaders were the dominant political force in southern Spain until 1492, ending with the fall of Granada. Northern Spain was the bastion of Christianity, and pitted in mortal combat with the Muslim south. The crusades to retake the Holy Land were paralleled by the Reconquista in Spain. Santiago is purported to have appeared in battle to personally hew down Muslim soldiers, hence the image of Santiago Matamoros. Saint James is portrayed as both the pilgrim, Santiago Peregrino, and the conqueror, Santiago Matamoros. The cockle shell is the common symbol of the Santiago Peregrino; the Cruz de Santiago, a stylized cross-sword is the icon of the sword-yielding Apostle.